Belgian fourth seed Kim Clijsters had to work hard before beating the eighth seed Anastasia Myskina of Russia 6-2 6-4 to reach the semi-finals of the Australian Open. The victory sees Clijsters into the semi-finals for the second year in a row and she will next face top seed Serena Williams for a place in the final. The 19-year-old Belgian, who had lost two of her previous four meetings against Myskina, started superbly. 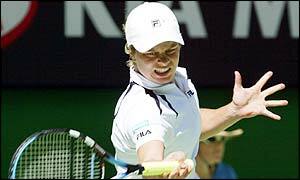 With Myskina struggling in her first Grand Slam quarter-final, Clijsters ran through the first set breaking her opponent three times. Her heavy forehand and outstanding retrieving kept Myskina on the run as the Russian was forced to scramble around the court in search of a winner. But in the second set the nerves started to show for Clijsters who admitted afterwards that she found her service games difficult. The 21-year-old Myskina battled back in the second set, recovering from an early break to level at 2-2 when she forced Clijsters into a loose forehand that sailed over the baseline. Although a double-fault from Myskina handed Clijsters the seventh game, the Russian promptly broke back again for 4-4. The unforced errors began to creep up for the Belgian, who finished with 37 for the match. But Clijsters blasted a forehand crosscourt to break again in the next game. She closed out the match with a crunching forehand down the line on her first match point after just over an hour at the Rod Laver Arena. But despite her victory Clijsters admitted she would have to step up another level against Serena Williams in the semi-finals. "I know that I have to play my best if I want to be capable of beating her. I'll just try to focus on my game," said Clijsters. "But it's nice because I'm sitting here in the semi-final and I haven't lost a set. I'm feeling very fresh still." Links to more 2003 stories are at the foot of the page.